Ambient dance down tempo experimental pop crossover modern rock noise progressive rock psychedelic. Nara was the first permanent capital of Japan. It's a mythical and traditional city full of history. Nara is the home of many sites of World Heritage. Nature is also abundant in Nara. Many ingenious and unique artists such as “Boredoms”and others hail from Nara. 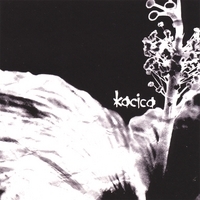 In January 2005, Miss Misato yamanaka (vocals, piano), Mr. Kaname Arai (guitar, synthesizer), Mr. Koji tanemura (guitar), Mr. Kazuya Hori (bass) (all residents of Nara) formed Kacica. Kacica, at first, experimented with guitar sampling and fusing Japanese concepts with the beautiful sounds of “Mogwai” and “Sigur Ros” . In March 2005, Mr. Hiroshi Atarashi (drums) joined Kacica, and since then there have been the five members. They combine “Brian Eno”'s kaleidoscopic new wave art, the progressiveness of “Pink Floyd” and “Radiohead” , and the psychedelic feel of “The Doors” and “The Velvet Underground” . Also, Miss Misato's ingenious vocals weave strong emotion into it all. In live performances, Kacica expresses it's uplifting feelings, and puts on a killer show. Since August 2005, Kacica has been doing performances nationwide. They continue to gain popularity, and even supported the “Minus The Bear” 's (post rock band of Seattle, USA) tour of Japan. In October 2006, they released their first album, self-titled “Kacica” through the well-known label : Pengtrade Records. Pengtrade Records has previously signed many internationally known artists. On their first tour, they performed 30 shows, gaining fans everywhere. Their first album continues to be a big hit. In response to their first album's success, Kacica released a remix album “My eye's, they're called the earth ” in March of 2007, which contains 4 remixed songs from their first album and a few unreleased songs. In the same month, Kacica supported the US band, “We are from Japan” 's tour of Japan.